PLAYING HOUSE is continuing its streak of stellar guest casting with tonight’s new episode: Rob Riggle stops by! And as great as the fabulous guest/supporting cast constantly are on PLAYING HOUSE, part of what makes it one of the best gems on television right now is its incredible (and unparralled) look at female friendship. With PLAYING HOUSE’s second season underway, the show is now being released in a unique way: though the episodes are airing on television in its normal time slot (Tuesdays at 10 PM on USA Network), the next episode is available online and On Demand a week before it shows up on TV. 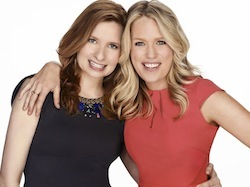 For PLAYING HOUSE creators/stars Jessica St. Clair and Lennon Parham, the episodes’ early availability could lead to spoiler-related issues — especially since both women are very active on social media, and regularly interact with the show’s biggest fans. Season 2 picks up a few months after we last saw Emma and Maggie, and the duo are raising baby Charlotte — adorably awkward family portrait, and all. But as fans of the show know, PLAYING HOUSE season 2 was never a sure thing — and as a result creators/stars/real-life best friends Jessica St. Clair (Emma) and Lennon Parham (Maggie) have been cherishing every moment they get to play in this world. USA Network has renewed PLAYING HOUSE for a second season.